“It is the smell of hard work,” I said. It was the odor of being cooped up for hours in stale air. I didn’t mention my near accident. So my SMRT cab, a Toyota Prius with the registration number SHC4123S, became my second home for 10 to 12 hours a day. I split a typical day into two, plying the roads from 6:30 a.m. to 11 a.m., and from 5 p.m. until I was too tired to go on. Every morning I would head first to Serangoon North or Ang Mo Kio housing estate, near my home. There are always passengers going to work from Housing Board estates. After that, there was no telling where I would end up. 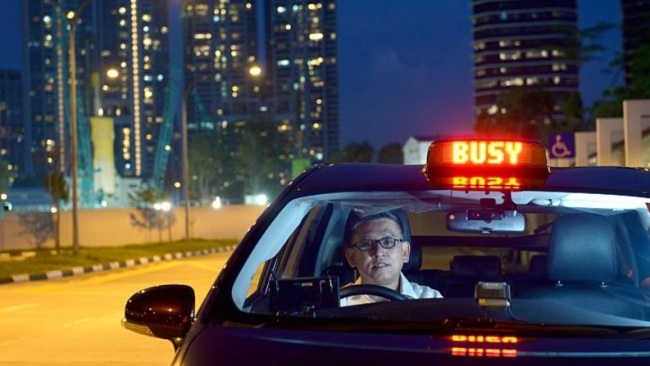 I thought I knew Singapore well, but my stint as a cabby took me to places I never knew existed. I picked up passengers from obscure spots like a sprawling offshore marine base in Loyang, and Punggol 17th Avenue in an area that somehow doesn’t have Avenues 1 to 16. I discovered that Tampines housing estate is so huge it is sandwiched between Tampines Expressway and the Pan Island Expressway, and is accessible via no fewer than seven expressway entrances and exits. I found myself in Tampines almost every other day during my cab driving stint. On Day 1, my first passenger was a man in his 30s, dressed in a blue long-sleeved shirt and black trousers. Those were the only words he uttered and he kept his eyes locked on his smartphone for the rest of the journey. He did not notice that in my excitement at picking up my first fare, I had forgotten to start the meter until about seven minutes into the trip. His fare was S$23.73 ($18.12) and I must have saved him about S$2. He gave me a hint of what was to come ― that most passengers prefer to be left alone. The rest of that day took me to Changi Airport, Bedok, Pickering Street, Alexandra Road, Amoy Street and Upper Bukit Timah Road in the morning. That evening, I went to Serangoon Road, Mount Vernon Road, Yishun, Woodlands, Sembawang Road, Tampines, Bedok, Bishan and Paya Lebar. All my passengers were people who flagged me on the street. I was not confident enough to respond to radio bookings, which would have needed me to reach the pickup point within five, seven or nine minutes of a call. So I ended up cruising empty most of that day, with the longest stretch of over an hour in Woodlands. The worst experience was after I picked up a woman at Khoo Teck Puat Hospital in the evening. She wanted to go to a condominium in Jalan Mata Ayer, off Sembawang Road, which I was unfamiliar with. She was from Myanmar, and I misunderstood her directions, given in halting English. When I took a wrong turn, she let fly with a rebuke in Myanmarese. The taxi meter showed S$9.44 but I said she could pay just S$8. That pacified her a little.